Wholesale pricing for vendors and resellers, please call for quotes. 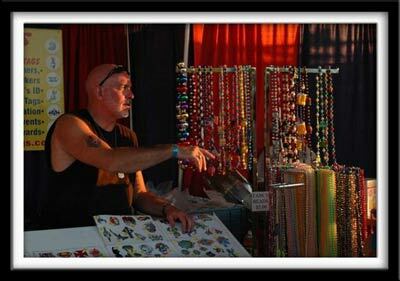 Since I began this company as a Street and Festival Vendor, I will always have a soft spot for the small business owner. The main reason we got into the design, manufacturing, wholesale, and retail of temporary tattoos is because I was dissatisfied with the quality of the designs that were available in the market place. I was a part owner of a “REAL” Tattoo Studio at the time, so I had a good idea of the kind of designs that the general public would be interested in buying. With this in mind, I commissioned tattoo designs in sizes, colors, and styles that would appeal to the broadest spectrum of potential consumers. We continue to add new designs on a weekly and monthly basis. Many of our best design ideas come from our customer’s requests. We can’t always meet those demands on an immediate basis, but we do our best to accommodate special requests. For instance, you might notice that we have a large selection of swimming and bicycling tattoos. Those designs, might not trip your trigger, but they are huge sellers to a very specific category of clients. Wholesale pricing is something we would really like to discuss with you to arrive at the best pricing for your particular needs. For instance, many of our customers order in smaller quantities, but by the end of the year, have purchased thousands of dollars in tattoos. We try to price them according to annual volume as opposed to weekly orders. Others don’t sell as many individual tattoos, but they send us a lot of Custom print jobs. I want to be as competitively priced as possible, so it is best to just pick up the phone and call. I am available 7 days a week for your convenience. The bottom line is that PRICE isn’t the most important factor when comparing my tattoos to my competitors’ tattoos. The difference of 5 or even 10 cents per tattoo isn’t much of an issue when I believe the QUALITY of my designs will outsell my competitors’ tattoos. My prices are already competitive, but it is better to apologize for price once than have to apologize for quality FOREVER. None of my customers have had any trouble competing when they work an event where another tattoo vendor is present. People are smart enough to comparison shop, and the vast majority are going to be more impressed with my designs. Most of my competition is selling cheesy “clip art” tattoos instead of original designs. Almost all of my tattoos have been done MANY TIMES as a permanent tattoo. That is the ultimate compliment for a temporary tattoo design. I am also available to help any Street and Beach vendor with set-up ideas, and I’m willing to help guide them to the most successful venues. Why reinvent the wheel? We learned from our mistakes so you don’t have to ! I would be happy to provide sample tattoos for your inspection. Give us a fair comparison with my competitors’ product and then you can decide for yourself. I look forward to hearing from you.